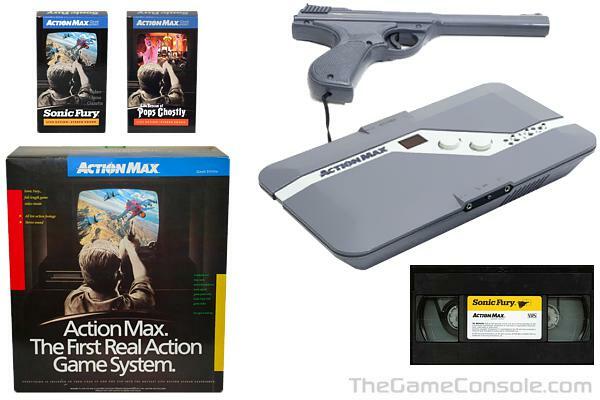 The Action Max is one of the few video game consoles that are not able to display graphics on its own, a VCR is required for game play. The system works by attaching directly to a VCR, which in turn transmits the video signal to your television. Sound is delivered through an internal speaker in the Action Max system itself. The included Light Sensor must be plugged into the console, then stuck to the television screen via a suction cup. All games are the same, whether it is shooting a ghost or a submarine, these are simple point and shoot games. There is no change or reaction to anything being displayed to you when you score a hit. Only a small noise is emitted from the console and the score counter increases. So what were the system's failings? Due to the linear nature of the games, targets appeared in the same places every single time, making memorization of "enemy" locations a real issue. While the system had three game variations and play for alternating gamers, it was nothing more than a fancy target game, no matter which videotape was utilized. Interestingly, at the end of each videotape "game", there were video previews of other releases, which also had targets and could be shot at and scored, acting like a (unintentional?) demo!